What Kinds of Sleep Apnea are There? There are three types of sleep apnea, obstructive, central, and complex. If you have obstructive sleep apnea, it is caused by the muscles of the your throat relaxing while sleep. When this occurs, the muscles provide less support to the tonsils, the uvula (the triangular piece of tissue that hangs from your soft palate), and the side walls of the throat. When these areas get less support, it narrows your airway and you can’t get an adequate breath in. If you have central sleep apnea, your brain is not sending the correct signals to the muscles that control your breathing. This causes you to have shallow breathing or to stop breathing for intervals of time. This type of apnea is more common after a stroke, with heart disease, or with narcotic or sedative use. 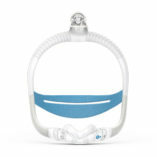 Complex sleep apnea is a combination of the obstructive and central forms.